Colorado's Democratic leadership will join us to speak about their legislative and legal priorities. We also plan to have a representative from the office of Congressman Joe Neguse. 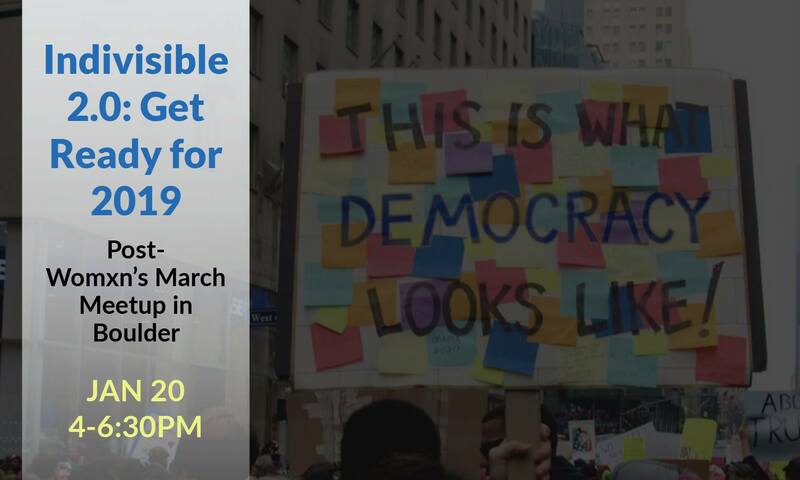 Indivisible's Gina McAfee and Jodi Rein will talk to us about how to go on the offensive in 2019, per the Indivisible Guide 2.0. And, come find your platform for activism. We have invited more than a dozen Colorado advocacy organizations to help you find opportunities to: protect health; fight climate change and fracking; protect immigrants; push for social justice and criminal justice reform; prepare for the 2020 Senate and Presidential elections. Don't miss it! This will be a snack/pot-luck style event. So bring a dish to share if you can!